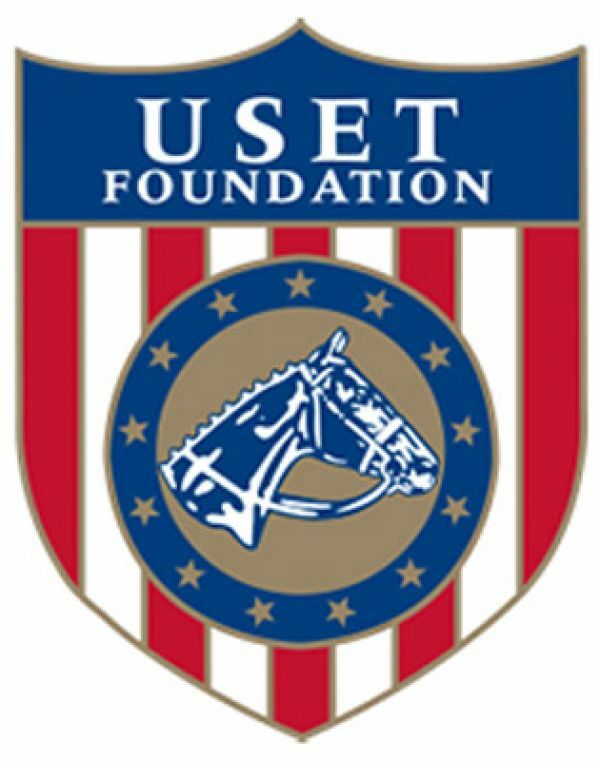 Antioch, IL - June 17, 2015 - George H. Morris started day three of the United States Equestrian Team Foundation's "Gladstone Program" at Annali-Brookwood Farm by riding along with his riders to encourage them to copy his flat work. Morris chose Michael Tokaruk's horse for the morning session to demonstrate and review some of Dr. Bennett's discussion from the previous day regarding flexion of the horse and correct position of the horse's neck. Morris worked on counter canter, transitions, haunches in and haunches out to supple the horse. He reviewed the importance of impulsion first when riding, then straightness and contact. Repetition of the exercises, not force, is what trains the horse. When the horse fails to yield to the rider's hand or leg, Morris explained to first rule out a physical issue. If the vet examines the horse and determines there is not a physical issue, then it is simply resistance to leg, seat and hand. "The horse has to accept us," said Morris. The groups then moved on to the jumping exercises with a three-stride line oxer to an oxer with a liverpool, finishing with several circles on the backside of the line. Hunter Holloway piloted VDL Bravo S over the viaduct wall with the 10 foot water underneath it. Next they jumped the viaduct wall with a 10-foot water underneath it, requiring riders to ride with leg. The final line in the exercise was a 4-foot vertical gate, four strides to an airy plank vertical then three strides to an oxer which was three strides from the end of the ring. Riders jumped the exercise both directions. Riders then put the entire gymnastic course together with circles at the ends of the ring to encourage straightness of the horse. "It's not the jumping that's the problem, it's the riding that's the problem," said Morris. "It's between the jumps we need to get better. Most people are inept in how to work a horse. Good horses are ridden with leg." The recurring theme during the training session is the better the horses are ridden, the easier the bigger jumps become. The afternoon session was a media presentation by Brenda Mueller on behalf of Chicago Equestrian/Phelps Media Group. Mueller owns and runs ChicagoEquestrian.com, a marketing and PR company with a Midwest market share and does freelance work for Phelps Media Group, an International media and PR firm out of Wellington, Florida. Mueller discussed how and why riders should create a brand for themselves and emphasized the importance of getting the message out through the various media channels. She talked about social media dos and don'ts along with different suggestions for marketing their brand. Input also came from DiAnn Langer, the U.S. Show Jumping Young Rider Chef d' Equipe, based on media experiences she has encountered with some of the teams to date. The major theme was how to consider the brand and image of the U.S. teams for future interviews and press conferences. Tips were discussed on handling questions from the media before riders each had a chance in the hot seat during a mock press conference. Three groups each had the opportunity to answer questions from their peers, who acted as journalists, firing questions that were challenging to answer. The answers were discussed so participants could understand the impact of their answers. Riders then spent time in the barn with manager and Hunter Derby Finals winner, Jennifer Alfano, getting grooming and care tips while putting their horses up for the night. The training session continues to day four with no stirrups during the riding sessions and discussion on conformation - form and function with Dr. Marvin Beeman from Littleton Animal Hospital in Colorado. The "Gladstone Program" is an intensive week of training and education for exceptionally dedicated and talented show jumping riders who are serious about their interest and desire to pursue a path that will prepare them for international competition. The training session continues through June 20, 2015. Auditors are welcome 8:00am to noon daily.